"It's made my life miserable." International crime rings targeting California's booming agriculture industry are increasingly stealing truckloads of high-value nuts, prompting authorities and the firms falling victim to ramp up efforts to break the spree costing millions. The sophisticated organizations in many cases use high-tech tactics, hacking into trucking companies to steal their identities. 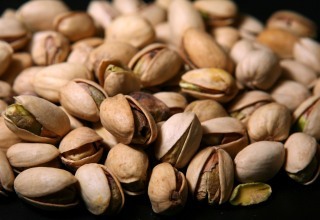 Armed with false shipping papers, they pose as legitimate truckers, driving off with loads of nuts such as almonds, walnuts or pistachios valued at $150,000, and some worth $500,000 each. Nut thefts hit an all-time high in California last year _ with losses totaling $4.6 million from 31 reported cases, more than the three previous years combined, according to CargoNet, an alliance of cargo shipping firms and law enforcement agencies aimed at preventing losses. Losses for all four years combined reached nearly $7.6 million, the group said. "It's made my life miserable,'' said Todd Crosswell, general manager of Caro Nut Co.
Caro was victimized six times last year for a total loss of $1.2 million. In each case, thieves stole cashews imported from Vietnam and Africa that were roasted, salted and packaged in Fresno. "You get hit with that kind of loss -- it hurts,'' Crosswell said. The value of nuts grown and processed in California, the nation's leading agricultural state, have soared in recent years as global demand for the health-food snack grows in places such as China and emerging economies. California produces more almonds, walnuts and pistachios than any other state, with a combined value of $9.3 billion in 2014. Almonds alone were valued at $5.9 billion, according to the U.S. Department of Agriculture. The high value of nuts grabbed the attention of criminal organizations, who are exploiting weaknesses in the cargo shipping industry to reap big profits, said Dan Bryant, supervisory special agent for the violent and organized crimes programs of the FBI Sacramento office. Bryant declined to identify any organizations under suspicion, citing an ongoing criminal investigation. Local authorities also are taking action. One state lawmaker has introduced a bill to fund a statewide taskforce targeting all types of cargo thefts. And law enforcement officials and nut processors met Thursday to share information to help prevent more nut thefts. In 2013, his office investigated a pistachio theft worth $189,000. No cases were reported the next year, but in 2015, six loads of almonds and pistachios were stolen at a combined loss of $1.6 million. Food and drinks are the most frequently stolen cargo items, Cornell said. Nuts are an easier target than other products, such as electronics, because there is no serial number and the evidence is gone once it is eaten, he said. Crosswell, of Caro Nut Co., said he's put in place new safeguards with hopes he doesn't fall victim once more, taking photographs and fingerprints of the roughly 25 truck drivers each day who pull up to the shipping docks. Despite these efforts, Crosswell said he fears the criminals will strike again.